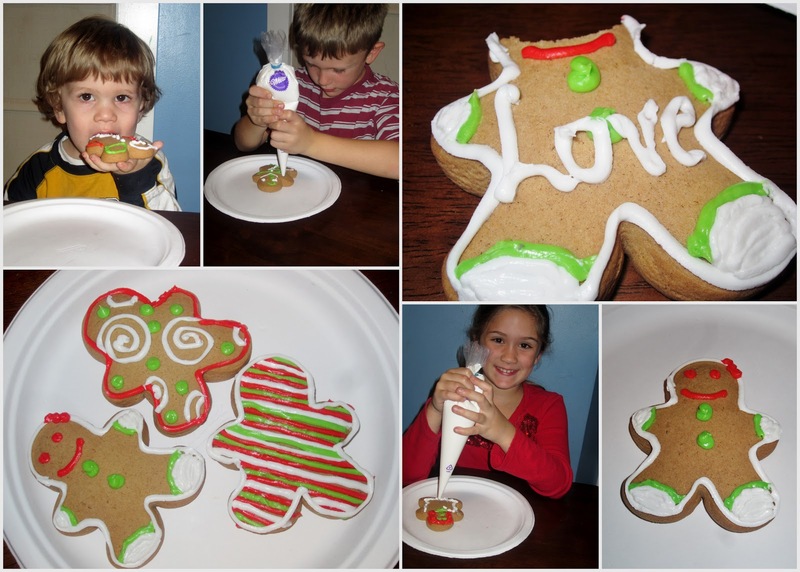 Decorating cookies is such a fun activity to do with the family. I still remember decorating cookies back when I was a little girl. I also remember the mess and hard work of it. It's something to bond over as a family. Even my non creative husband can get involved and have a blast. In the end it doesn't matter if you are really good at decorating cookies. It's the fun and taste that counts! Cookies By Design has a really fun cookie decorating kit for the foodie family. 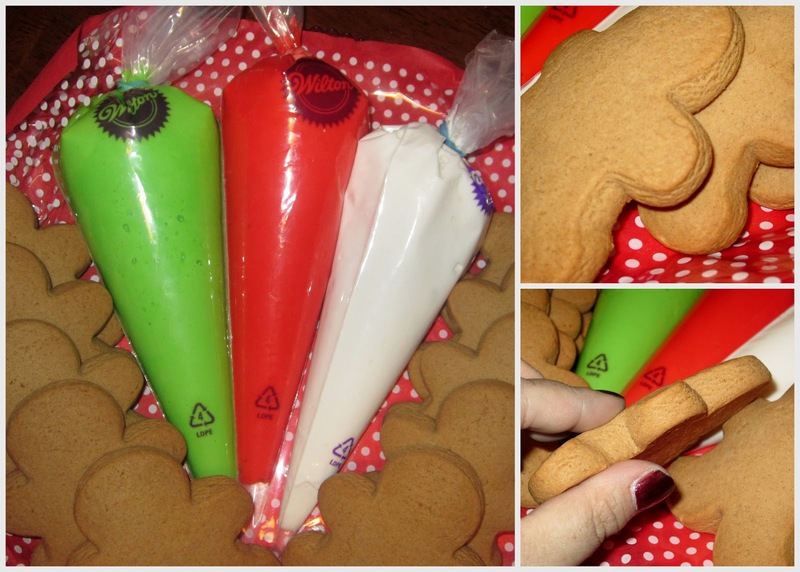 The kit comes with holiday-shaped sugar cookies and red/green/white icing tubes, all neatly packaged on a tray and tied with ribbon. Priced at $29.99 for 10 cookies and 3 icing tubes. This kit would a very thoughtful gift for anybody on your holiday list. The cookies included inside of our kit were delicious, thick and soft. Our sugar cookies tasted like a lightly spiced gingerbread. The icing was the perfect consistency for decorating. It was a simple, sweet icing that had just the right amount of coloring added to make everything lovely and bright. I loved that I didn't have to mix up my own icing. The last time I made my own icing and cookies I was exhausted at the end of it all and I'd spent a lot of time up. The mess took the fun out of it. I will start right off by saying that the Cookies By Design kit is so convenient! I just cut the tip off of the icing bags and the kids and I set to decorating the perfectly shaped cookies. I tried to teach them the proper way to hold an icing bag but they just wanted to squeeze. Luckily Cookies by Design though of this and had tied the top of each bag shut with a good rubber band. This prevented the icing from exploding all over. We had so much fun decorating cookies and eating cookies. The time spent together was priceless. We created a wonderful memory and it was stress free for me and practically mess free as well. For the hard-to-shop-for boy/man: Cookies by Design has licensing agreements with the NFL, NBA and NHL to custom make a cookie bouquet for his favorite team! To make it personal, write his name on a jersey-shaped cookie. Prices start at $17.49. · For the girly tween – Consider a Rock Star cookie bouquet, which can be tweaked for the holidays, for your little rebel without a cause. A fun idea is to pair this bouquet with a new CD, iTunes gift card or concert tickets. Prices start at $15.49 for a 2-cookie bouquet. · For the college student or ultimate fan: Cookies by Design also has a licensing agreement with the NCAA. With the holidays in between football and basketball, it’s the perfect time to represent the family alma mater with a university-themed cookie bouquet. Prices start at $17.49. · For the grandparent: Give grandma and grandpa something to brag about – a cookie bouquet customized with each grandchild’s name on a cookie. Prices start at $15.49 for a 2-cookie bouquet.